Zinedine Zidane as Manchester United's new manager. That is what the French coach is dreaming about according to the newspaper 'L'Equipe' with the former Real Madrid coach being tempted to try his hand in the Premier League. 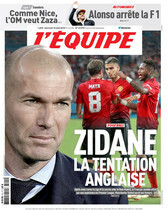 Zidane, according to the newspaper, loves the idea of working in England. After his shock exit at Real Madrid, winning three consecutive Champions League titles, he was linked with a move to Juventus. However following the World Cup in Russia, that opportunity was no longer available. Instead Zidane will instead take a year off to relax following the mental stress he was under at Real Madrid. It'll also give him the time to plan his next move. According to 'L'Equipe', the Premier League is what interests him the most. The team which stands out for Zidane is Manchester United. Of course, Jose Mourinho is the current man in charge but it appears his time at the club is coming to an end, either during the course of this season or at beginning of the next one. Zidane remains silent as he enjoys his break from the game but it'll be interesting to see how Mourinho reacts to this news.